More awesome information from our partners at Constant Contact. If you’re sending emails to customers, you want your messages to look good when they land in the inbox. 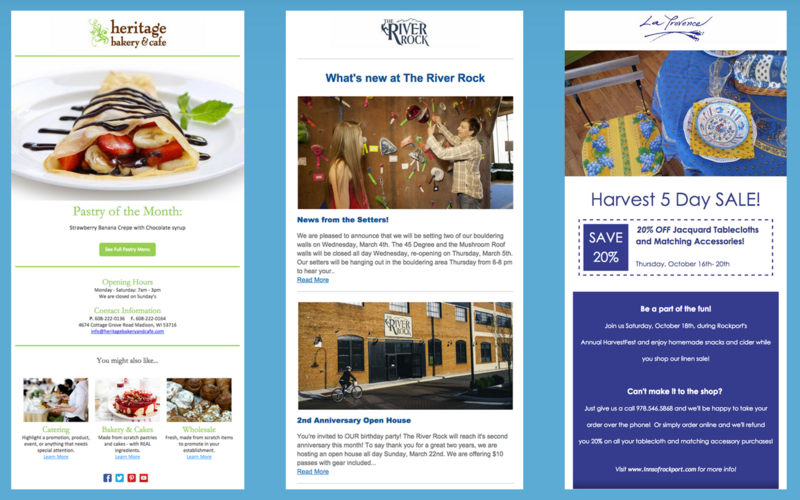 Because when your emails look good, your business looks good too. And that can lead to more people actually paying attention to your emails, trusting your business, and acting on the messages you send out. This may seem pretty straightforward, but if you’re a business that’s still using a personal email account (Gmail, Outlook, Yahoo, etc.) to send your emails, you’ve probably already noticed that there’s not a lot you can do to make your emails look good in the inbox. You’re able to reach your email readers, but you know that your emails don’t look their best. Luckily, email marketing services like Constant Contact make it easy to look great in any inbox. If you’re a Constant Contact customer, you’ve hopefully already seen the benefits of our customizable email templates, which allow you to add your content and customize every email you send out. One of the most important aspects of using an email template is making sure you add your branding to the messages you send out. Branding your emails will help your business stand out in your current customers’ inboxes. Since they already know your brand, it’s important to make your business recognizable so they can quickly associate an email with your business. It will also help you build familiarity with potential customers who signed up to learn more about what you have to offer. 1. Add your logo You can easily upload and store your logo in your Constant Contact account. Make sure to position your logo at the top of an email you send out so that it’s one of the first things people see when they click to open. 2. Customize your colors You don’t have to guess which colors fit your brand. Tools like Color Cop for PC users, or Digital Color Meter for Macs, allow you to pull the RGB or Hex value of the colors on your website or in your logo. You can then enter these values into your Constant Contact account and we’ll provide the colors that match. 3. Use consistent fonts When choosing fonts for your emails, it’s typically best to keep things simple. Using too many different fonts can make your emails look messy and distract readers from the message you want to get across. Hopefully, you’re already using a consistent font on your website or blog that you could also use in your emails. Choose one or two fonts that fit your brand and be consistent with each message you send out. 4. Add visuals Your email should have an eye-catching image that pulls the reader in and makes them want to pay attention. One of the best places to find photos that help with branding will be on your social media sites. Choose photos that help people get to know, like, and trust your business — like photos of your staff, products, or loyal customers. 5. Include relevant links In addition to the links you include for people to take action on your emails, (shop online, donate, register, etc.) you should also include links to places like your website and social channels so that people can connect with you beyond the inbox and learn more about what you have to offer. With an email template, you can easily add social media buttons that link directly to your Facebook, Twitter, LinkedIn, Pinterest, or Instagram accounts. 6. Find your voice This one can take a little practice, but as you continue to send emails on a regular basis you really need to think about the “voice” you use in the messages you send out. After all, your brand isn’t just about the look of your messages; it’s also reflected in the content that you write. This is something Peter Lovis, owner of Concord Cheese Shop talked about when he was a guest on the second episode of our Small Biz Stories Podcast. Take a look at some of your recent emails. Are you using a consistent voice that’s reflective of the type of service your business offers? Does it sound like it’s coming from you, or could it be mistaken for an email from any other company? Finding your voice will help your emails better connect with your readers and strengthen your brand in the process. What can you do today? If you’re already using email marketing, take a look at your latest email to see if you can put any of these branding tips to work. Once you have a branded template created, you’ll be able to copy it next time you’re ready to send and just update your email content. Log in now to get started. is this a free service to Homestead clients? Unfortunately, Constant Contact is not free, but the advice can be used for any email you send. Email marketing just gives you extra bells and whistles that can be very beneficial. How do you upload your email contact list? my outlook does not allow me to see my address book does homestead? if so how do I view/organize my list? Constant Contact maintains a list for you. It is separate from your email program contacts. You can type in Contacts or you can import contacts from various file types. If you use Outlook, Constant Contact has an import option from Outlook.